Mushroom Kingdom U across the series. Main: Ground Theme / Underground Theme - Super Mario Bros.
Mushroom Kingdom U (マリオUワールド, Mario U World) is a stage in Super Smash Bros. for Wii U and Super Smash Bros. Ultimate. Bowser is fought here for his unlock battle in Ultimate. This stage possesses four different layouts; it switches between them when Kamek appears and casts a spell. The Acorn Plains version in Super Smash Bros. for Wii U. The starting version, set in a grassland. Features a large main platforms with three smaller soft platforms above. The Rock-Candy Mines version, also featuring some water spouts and a Big Urchin. Set in the mountains, it features a single rock platform balanced on the tip of a spire; the platform balances like a lever. Set above pink clouds, features two walled platforms separated by a pit, with floating platforms above the pit and the right platform. The Slide Lift Tower version. Set in the inside of a tower, features two solid blocks which move along a rectangular rail. In their movement the blocks rub onto each other, and are able to push fighters and items. A giant beanstalk which sprouts from the background and grow branches and leaves, which players can use as platforms. The beanstalk disappears after some time. Droplets of water which fall from the sky, soon followed by a giant icicle that freezes any player who touches it while it is falling. After striking the ground, icicles serve as platforms which can be damaged and destroyed by attacks. Water geysers which spout upwards, acting as extra platforms. Players who touch them will be lifted up. Some of these geysers carry damaging Big Urchins on top of them. Various sets of Stretch Blocks, small blocks which act as solid platforms can autonomously stretch horizontally. Several Tower-themed soft platforms which traverse the stage horizontally. Nabbit, having caught Luigi in his bag. Nabbit shows up periodically when the stage transforms. He chases after players and tries to catch them in his bag; once he traps a player he attempts to blast off smoke towards the upper blast line, much like the Beetle and Boss Galaga items. Nabbit is treated as a fighter, and therefore is vulnerable to attacks, grabs, and items - he even takes knockback proportional to damage - and can be defeated by being launched beyond the blast lines. In Super Smash Bros. for Wii U, the Ω form is set on a flat rock platform with grass on top in the Acorn Plains portion of the regular form. Star KOs can occur. In Super Smash Bros. Ultimate, Ω form and Battlefield form are similar to the Ω form in SSB4; however, the main platform is now made of the grassy soil found in the beginning of the Acorn Plains portion and is resized and reshaped to match Final Destination and Battlefield, respectively. The three soft platforms of the Battlefield form are based on the three soft platforms in the Acorn Plains section of the normal form. 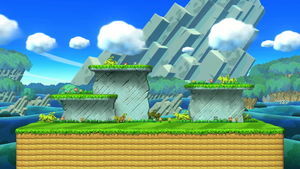 Acorn Plains as it originally appeared in New Super Mario Bros. U. 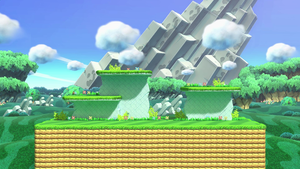 This stage is a combination of several stages from New Super Mario Bros. U. The main stage variations are based on: its first world, Acorn Plains; its sixth world, Rock-Candy Mines; its seventh world, Meringue Clouds; and the various tower levels, particularly the Slide Lift Tower. Water geysers, with or without Big Urchins on top, are common in the world Sparkling Waters, while falling icicles which can be used as platforms appear in Frosted Glacier. The beanstalk originates from the Sparkling Waters hidden level: Skyward Stalk. Kamek is a high-ranking member of Bowser's army and one of the main antagonists in the Yoshi series, a Magikoopa who, in the recent New Super Mario Bros. games, appears at the beginning of boss battles to transform the arena. Nabbit first appeared in New Super Mario Bros. U. He is a rabbit thief who steals items from Toad Houses: players then can chase him across levels to retrieve the stolen items, being rewarded with a P-Acorn upon capture. Nabbit also appears to take the prize in enemy courses if players do not retrieve it in time. Mushroom Kingdom U is banned from tournaments due to its several disruptive hazards such as icicles, Big Urchins, and Nabbit. It does, however, have a fairly neutral layout with hazards off, which has made its legality more debatable with hazards off. The reveal photo of the stage, featuring the Acorn Plains version and some Stretch Blocks. Nabbit being attacked by Captain Falcon. Robin frozen by an icicle. On rare occasions, an icicle will fall onto another one. Mario and Bowser are all set and ready to fight. Duck Hunt trying to nab Chef Kawasaki's cherry pie on the stage. Isabelle using her up smash in front of Kapp'n on the stage. Despite Olimar's Final Smash freezing the stage when it is used, Icicles will continue to fall. This page was last edited on April 17, 2019, at 02:40.